Since 1992, Ocean Machinery has been selling robust and very affordable CNC solutions to structural Steel Fabricators around the world. The NEW Ocean Liberator is the most affordable beam coping machine in the world, and is the result of a strong ongoing collaboration with Peddinghaus, the number one manufacturer of structural steel fabricating machinery. 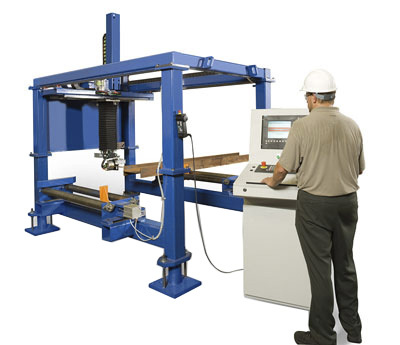 In the same way that the Ocean Avenger CNC Beam Line and the Ocean Clipper CNC Angle Line brought affordable automation of beams and angles to the small-to-medium fabricator, the Ocean Liberator similarly brings automated beam coping into shops that otherwise could never have considered it. What is the Ocean Liberator CNC Beam Coping Machine? The Ocean Liberator is made with pride in the USA by Peddinghaus exclusively for Ocean Machinery. The Liberator can be programmed directly at the machine using its own intuitive graphical programming software, or it can be programmed directly from you steel detailers CAD details. The summary below gives a quick insight into the machine design and performance. For more details, follow the navigation at the left. This solid frame provides the rigid platform from which the fully articulated 5-axis torch is driven, ensuring accurate and repeatable copes and cuts in a variety of profiles. The torch uses a 5-axis fully articulated cutting torch, which allows it to cut from any angle on any surface, easily allowing bevel cuts in both the web and the flanges, something that more expensive multi-head machines are unable to do. The Liberator cuts steel fast, cutting at speeds of up to 30 inches per minute depending on material thickness and hardness, type of gas, flame adjustments, and other factors, and has a fast positioning speed of up to 400 inches per minute. The simple-to-program Peddimat software is pre-installed on the Ocean Liberator, and can be installed on the client desktops and laptops at no extra charge per seat. Peddimat is simple to learn and typical blue collar operators learn to program standard copes within the first hour of training. The Peddimat software is found on all of Ocean Machinery's CNC products, and is the same software found on all of Peddinghaus large CNC structural fabricating machines. Moreover, if you are detailing in one of the several 3-D framework CAD detailing programs on the market such as SDS/2, X-Steel, Tekla Structures, StruCAD, ProSteel 3D and others, then the operator has to merely import the part program and push the cycle start button. The software is seamlessly compatible with most DSTV (*.NC1) format for easy downloading direct to the machine.